Martin Gott’s cheese-making day doesn’t start until 8.30 am. By that time the milk vat is full. Most of the small farms that supply cheese to the Courtyard Dairy use around 1,000-3,000 litres of milk each day. So 100 litres is comparatively a tiny amount, and it means Martin only makes a handful (barely 12) ‘St James’ cheeses each day. Making St James on such a small scale is one reason it’s special. But there are loads more reasons too: seasonality, farming techniques, method of cheese-making, and ultimately, the dedication of Martin and his partner Nicola, all of which make St James Cheese truly unique – a farmhouse cheese that truly reflects terroir. Martin grew up in Cumbria, a member of the famous Gott dynasty, who ran butchers shops and markets throughout the region, including Barrow, Lancaster, Kendal and Morecambe. A proper Cumbrian lad, he met Nicola, at an early age – they both attended the same secondary school in Kirkby Lonsdale. After leaving school, Martin trained as a butcher on the family farm with his father, Peter Gott, then went on to take over running their stall in London’s famous Borough Market. But Martin had been inspired in his childhood by a visit made to his Dad’s farm by famous British cheese pioneer James Aldridge. And so Martin left the family business to take up an apprenticeship with the Kirkham family, makers of the eponymous Kirkham’s Lancashire cheese. 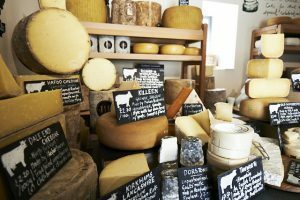 Eighteen-months later, and with a spell of cheese-making under his belt, Martin left the north with Nicola and move to Bath to make cheese seasonally for legendary farmhouse cheese-maker Mary Holbrook. As they learnt more about sheep and dairy husbandry, they refined their cheese-making skills. Working for Mary during the week, Martin and Nicola would use their spare time to keep a few sheep of their own and use the milk to make some interesting cheeses – cheeses that sold well at Bath Farmers’ Market each weekend. This was when St James was born – from experiments they made with different recipes and varying procedures. They decided to return to the north and set-up a farm of their own. With no backing or finances they managed to secure a tenancy on a small parcel of land (20 acres – about four fields) with a barn on the Holker Estate, near Cartmel. This ‘marginal’ land is difficult to farm, so sheep were the chosen animal, being able to survive well on the wet marshy land. Investing in the Lacaune breed, bought direct from France (a breed that has been bred exclusively to produce rich milk for cheese-making, and is used in Roquefort production), they began to set up a small-scale sustainable farm. Nowadays they farm 100 sheep, which are milked seasonally after the spring lambing when the sheep are out at pasture. In autumn, when the milk stops flowing as the days get shorter, the sheep are ‘tupped’, ready for next year’s supply of spring lambs. Nicola rises early and milks the sheep each morning by herself. The raw, unpasteurised milk is transported warm into the dairy where Martin can start to make the St James cheese. Martin doesn’t use commercial ‘starter-culture bacteria’ to make cheese; he prefers old-fashioned methods to sour the milk naturally to make cheese. This involves hand milking his best five sheep and culturing their milk, before analysing each of the soured milks flavours, cleanliness and acidities. The best will be chosen and used as a ‘culture’ to make cheese for the season. Most cheese-makers buy pre-set cultures for this stage; by making his own culture, Martin makes a cheese truly unique to his animals. 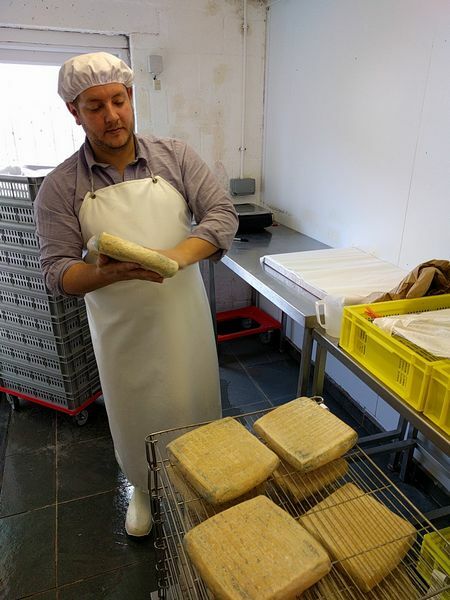 In fact he has recently been awarded a Nuffield farming scholarship to study “The prevalence and importance of indigenous bacterial cultures in raw milk cheese” to help increase the understanding and popularity of this style of farmhouse cheese-making. 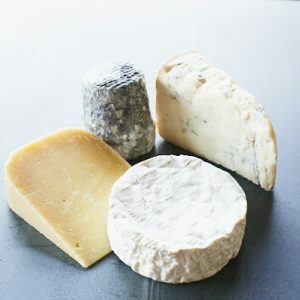 The method of making St James cheese is relatively short, and has similarities with making Lancashire (slow acidification overnight) and Alpine cheeses (such as Reblochon). After the starter-culture is added, the curd is set fast, cut and stirred. Sheep’s milk sets thicker and harder than cows as it has more calcium and nutrients. 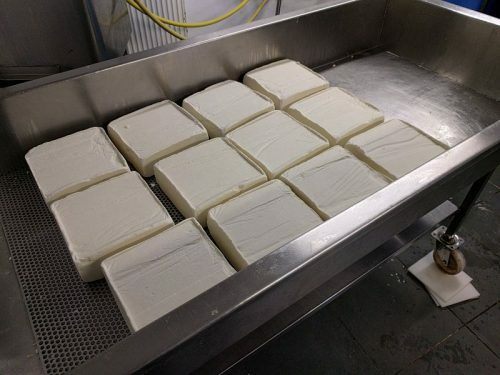 The curd is then ladled into the cheese moulds and allowed to drain. Yesterday’s cheeses will be salted and kept in a warm, humid room to allow the natural yeasts to grow. Over the next two to three weeks, St James cheeses are regularly ‘washed’ to encourage the pink-red rind that gives this rich, soft, sheep’s-milk cheese a whole lot of flavour. 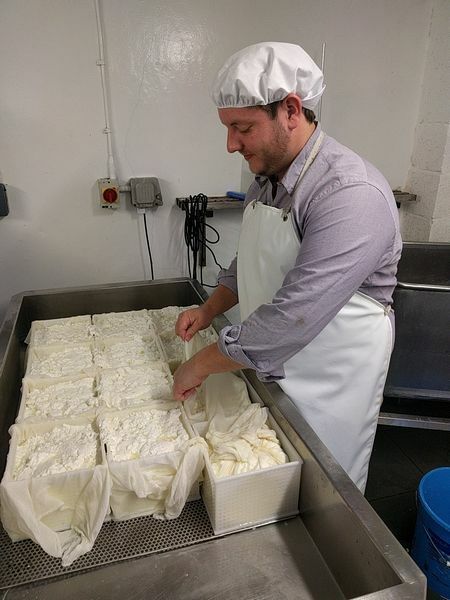 All the cheese-making dairy tasks are completed by midday – which is essential to allow Martin to help Nicola in the general running of the farm. 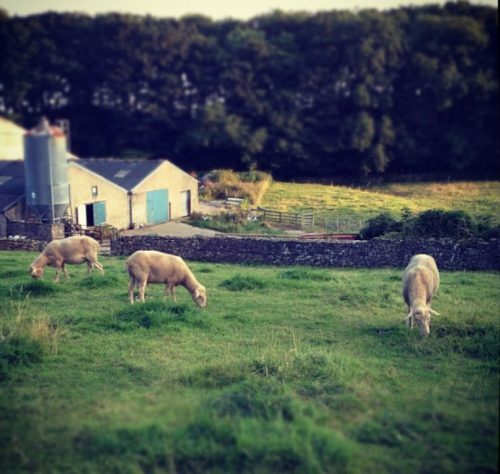 The left-over whey from the cheese-making is used to feed the rare-breed British Lop pigs they keep (many of which are sold whole to the nearby esteemed L’Enclume restaurant), and the lambs that aren’t kept to become ‘milkers’ are also sold to nearby restaurants. These three revenue streams help to keep their small farm viable. Martin and Nicola’s hard work and effort is a true labour of love, but one that magically captures the rugged, beautiful Cumbrian terroir in their amazing and truly unique farmhouse cheese – St James.